Dinosaurs have captured our collective imagination since Sir Richard Owen first described them in 1842. Their great size alone makes them unique in the history of terrestrial vertebrates. But their bones raise many questions. What did they look like? Were they fast or slow? How did they feed? How did they defend themselves? Using actual fossils, field paleontologist, Rob Sula, will interpret the lives and behaviors of Dinosaurs. 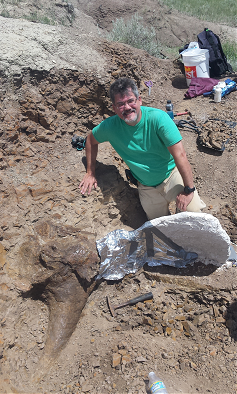 Rob Sula has hundreds of hours of experience hunting and excavating dinosaurs. As a guide, Rob has led groups prospecting for dinosaur remains in the Hell Creek Formation since 1998. Rob has participated in over 25 major paleontology excavations and has supervised several excavations including three dinosaurs with skin preservation. In 1999 Rob co-discovered the Licking Leaf site, which has produced over 100 new species of late Cretaceous plants. In 2003 Rob found a 36-foot Tylosaurus proriger that was so complete it had preserved skin on the rib cage. The discovery and excavation of this specimen is the subject of the National Geographic Children’s book, Dinosaurs. Rob has contributed, through writing and illustration, to several publications including Mark Renz’s Megalodon Hunting the Hunter and Jack Wittry’s The Mazon Creek Fossil Fauna. Rob has a BFA in Drawing and Painting from the University of Michigan and an Art Education Certification from the School of the Art Institute of Chicago.